Last week, 45,000 residents in California lost power due to equipment damage at PG&E’s El Cerrito Substation. The culprit? A squirrel. The little woodland creature shouldered the blame for a two-hour outage that shut down the Downtown Berkeley BART station and left a graduation ceremony in the dark. 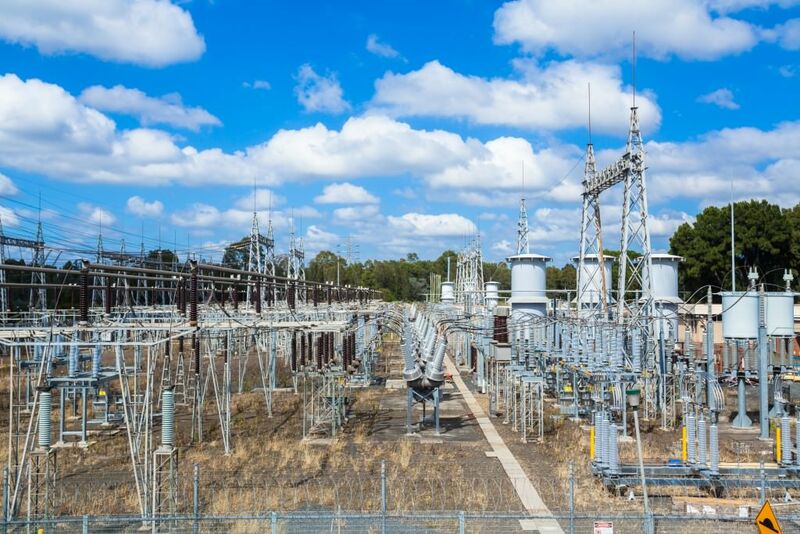 Simultaneously, another 7,500 residents nearby were powerless when another substation experienced failures due to heat, causing complications for emergency responders. Incidents like these are not uncommon. Animals caused about 7% of reported U.S. power outages in 2013, and squirrels were especially ferocious—causing more animal-related outages than birds, raccoons, snakes, rodents, cats, and beavers combined. Of course, the bigger issue is weather—including heat, wind, storms, and ice—that damage equipment or bring power lines into contact with trees. Weather/tree incidents account for about 30% of reported U.S. outages, followed closely by faulty equipment/human error (28%). The incidents last week were contained to a few towns for a couple hours, giving everyone a good chuckle about the squirrel bit. End of story. Except, the largest U.S. blackouts were all sparked by minor incidents, seemingly routine—a lightning strike, a sagging power line brushing against trees, a simple human error. The problem is not so much the initial cause, as the fact that minor incidents could trigger large, cascading disruptions. To address this issue head-on, the U.S. Department of Energy (DOE) has partnered with researchers and owners and operators to develop new technologies that provide real-time visibility of potential problems over wide geographic areas. The National Synchrophasor Initiative (NASPI) has been working to develop and implement synchrophasors, which are tools that allow for simultaneous real-time measurements at multiple remote points on the power grid. An incomplete picture of grid health—even a delay of a few seconds in reporting data—can allow power disturbances to go largely unnoticed until there is a widespread disruption. A network of these synchrophasors can report information on grid voltage and current to operators at around 30 times per second—50 to 100 times faster than the current technology. The accurate and real-time measurements provided by the synchrophasors increases visibility to owners and operators on potential power disturbances and unanticipated or cascading consequences. The increased visibility provided by larger, more accurate data sets enables owners and operators to respond much faster to potential issues, decreasing the likelihood that power outages will cascade, affecting other critical infrastructure, such as communications, water, and transportation. Forecasts of higher-than-average temperatures for the Northeast this summer may potentially place even greater strain on the aging electric grid, making the incorporation of technologies like synchrophasors all the more critical. Unanticipated events may always present some level of risk, but improved visibility and information sharing make rapid response possible, regardless of whether the summer heat or a meddlesome rodent is to blame. 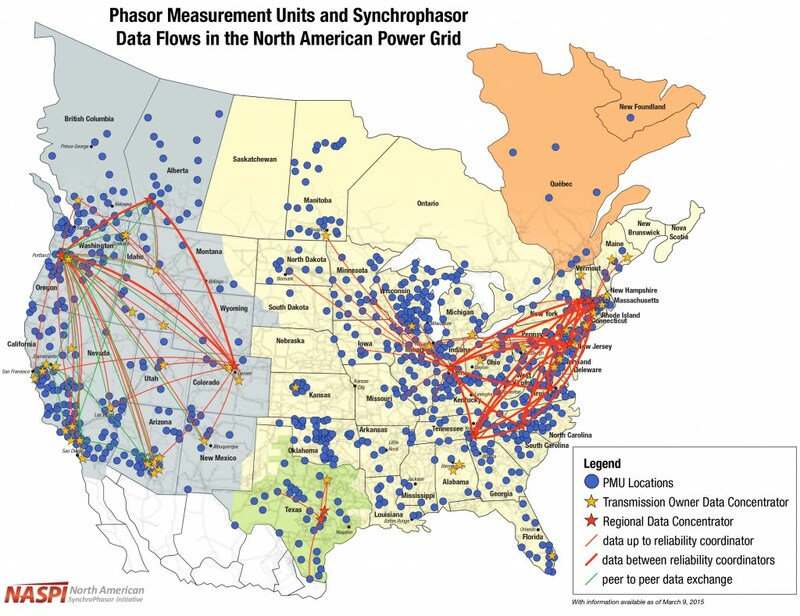 Map showing the locations of Phasor Measurement Units (PMUs) currently installed in North America, naspi.org.